Pure Wool Jacket in blue and green tartan. Classic peak lapel in black contrast fabric, 2 angled flap pockets with black... Pure Wool Jacket in blue and green tartan. Classic peak lapel in black contrast fabric, 2 angled flap pockets with black trims in contrast, 2 vents at back, 1 covered button in contrast on the front with angled buttonhole and 3 covered buttons in contrast for each sleeve. Rounded finish to stylize the figure and tail of jacket suitable for any height. 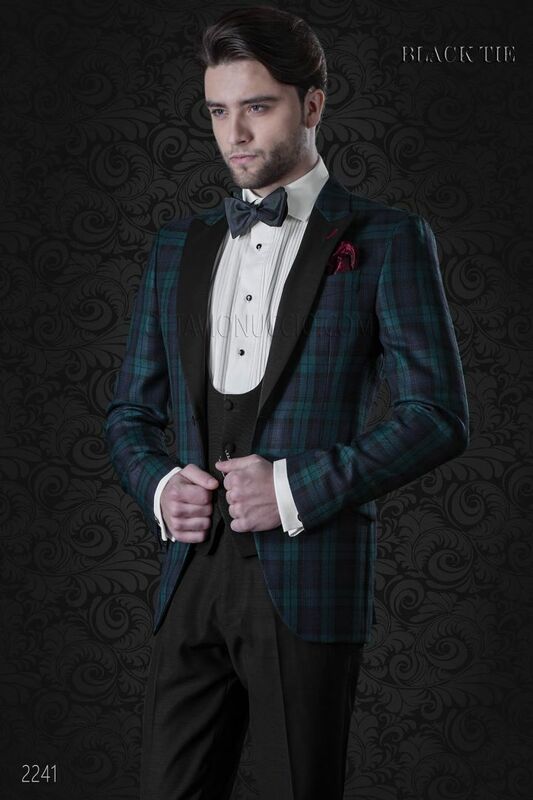 Waistcoat made from a black wool blend with 3 covered buttons closure. Self-tie bow-tie made from 100% green tartan silk. Handmade.